Temperatures will remain much colder than average well into next week. The National Weather Service say temps will moderate a a bit for Monday and Tuesday, but will still remain below normal. The average maximum temperature for Dec. 7 in the Danbury area is 42 degrees with normal minium temperature of 25. On Friday, the daytime high and evening low will be more than 10 degrees colder. Along the Long Island Sound shoreline, there average high temperature is 45 degrees and the average minium is 31. Bridgeport and New Haven’s expected low of 19 Friday night will be 12 degrees colder that average. Friday’s warmest temperature is expected around 2 p.m. and then steadily drop more than 15 degrees before dawn Saturday morning. Coldest readings will be between 5 and 7 a.m. Saturday. It also says a coastal storm that is expected to develop off the Carolinas Sunday night will stay well to our south. Today: Sunny, with a high near 33. 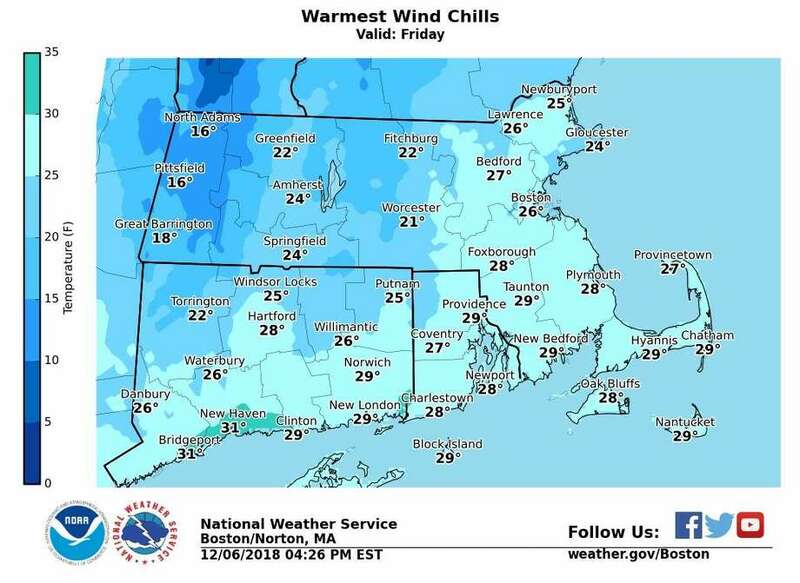 Wind chill values between 20 and 25. Northwest wind 7 to 11 mph. Tonight: Mostly clear, with a low around 16. Northwest wind 5 to 9 mph becoming light after midnight. Saturday: Mostly sunny, with a high near 32. Wind chill values between 15 and 25. West wind 3 to 7 mph. Saturday Night: Partly cloudy, with a low around 16. Wind chill values between 10 and 15. West wind 3 to 6 mph. Sunday: Sunny, with a high near 35. Calm wind becoming northwest around 5 mph. Monday: Mostly sunny, with a high near 37.